ANNAPOLIS, Md. — When Connor Drucis gets the competitive juices flowing, that's when he's most comfortable. “I like competing in practice. I like competing in meets. It's just something that's always been a little calming,” said the St. Mary's High School junior. “I would definitely say the mile or the thousand. I'm a distance swimmer,” he said. Drucis is the captain of the five-time defending Maryland Interscholastic Athletic Association 'B' conference champions. He's two-time all-conference and a state finalist and his goal is the USA Swimming Junior Nationals, but coaching may also be in his future. “He not only helps us while in the pool, he helps us outside of the pool, determining who should swim what and how, and that's been a huge part of our success over the last three years,” said St. Mary's swim coach Allyson Reiter. Connor is big on researching his opponent and studying film, but that's not the only area where he applies himself. “I've held a 4.0 since my beginning at St. Mary's,” he said. “He has depth and hard work and his hard work, I think, is part of his academic success,” added Reiter. Connor also plays soccer and runs track, but his future is in the water and in the books. “My academic goal is to keep the 4.0 at St. Mary's and then if I can swim in college that would be great,” he said. 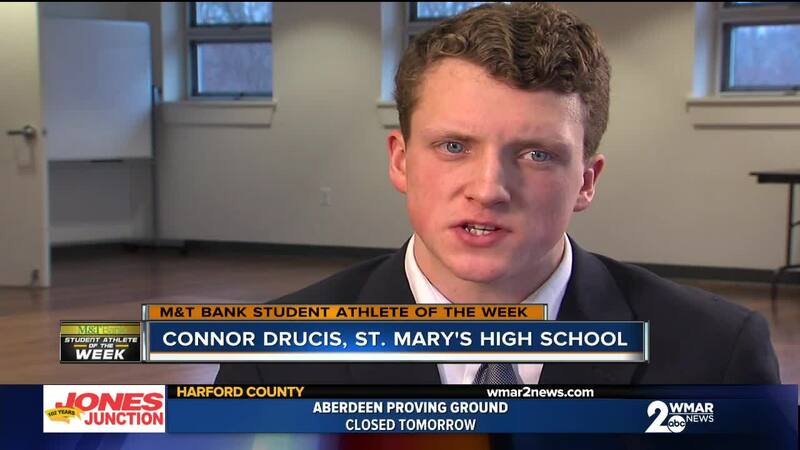 Congratulations Connor Drucis. You are this week's M&T Bank Student Athlete of the Week. To nominate a student athlete to be the next M&T Bank Student Athlete of the Week click here .